Here at George's Gym we are looking for a new staff member/members (1-2 depending on availability), beginning 12/15/18 or potentially sooner! 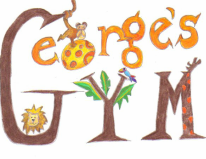 George's Gym is a completely mobile business for children! We teach Tumbling, Motor Skill Development and Fitness classes during the week and do Birthday Parties on the weekends! We work in homes, schools, camps and daycare's all over Chicago and the North Shore. Tips come into play if you can work weekends too! ​Please feel free to text, call, email or simply fill out the form below if you're interested or have any questions!